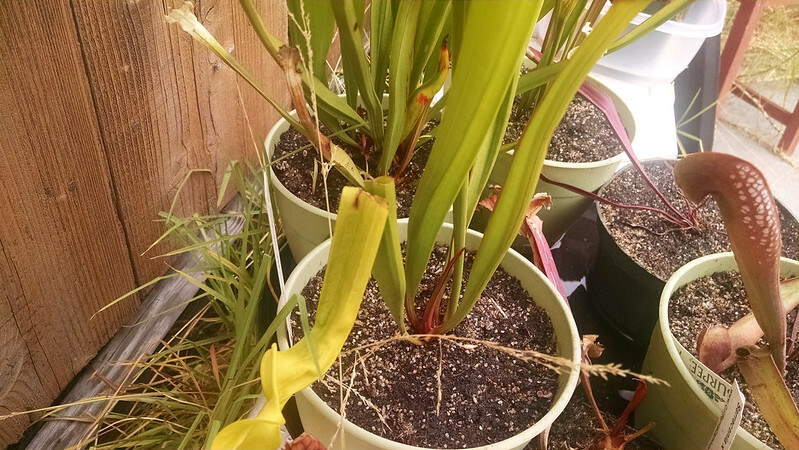 Challenges growing Sarracenia outdoors |Sundews Etc. 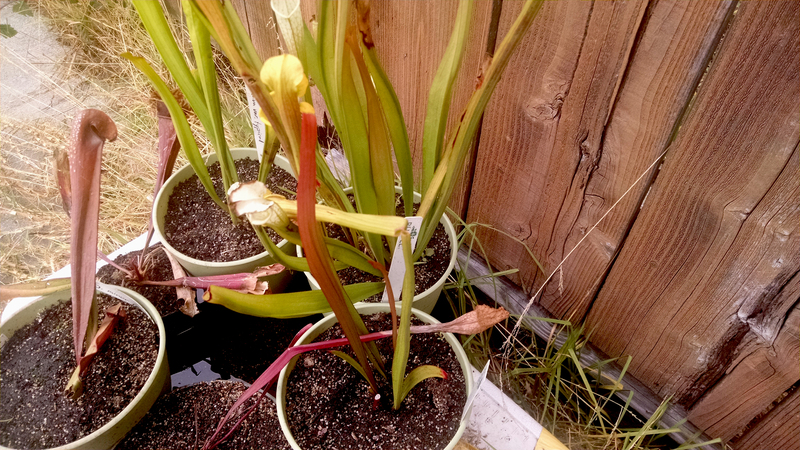 I don't post about my Sarracenia very often. In large part that's because they're really difficult to photograph with my phone camera, which loves to focus on the wood grain of the fence in the background rather than the pitcher in the foreground. Whatever. In any case, here's how they looked today. The outdoor growing area is still pretty haphazard. 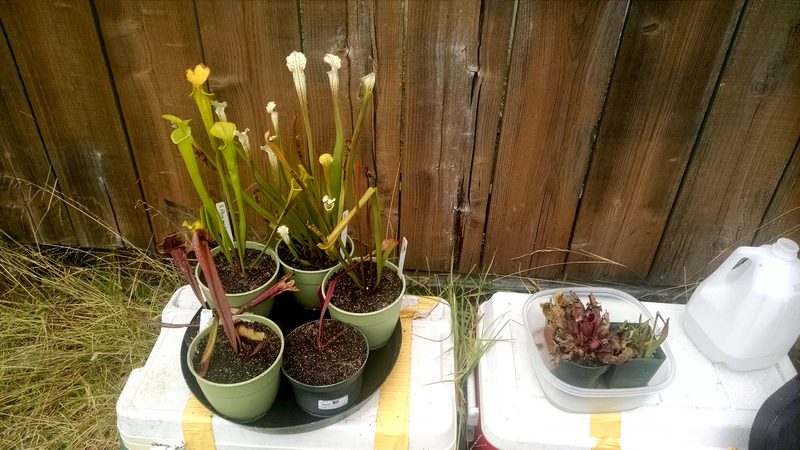 First of all, they are definitely pitchering pretty nicely, especially that Sarracenia leucophylla in the background, and the Sarracenia flava var. maxima on the left. I've seen some good rhizome expansion too, especially on the S. leucophylla. The clones I have are pretty attractive. The S. flava maxima has wonderful lid shape, and the Sarracenia minor is really nicely colored. However, there are definitely problems. First of all, I think this area is much too windy. Check out these broken pitchers. It can get powerfully windy in my neighborhood and I think it's just too much for these pitchers. The breaks are too clean to be chewing, and the pitchers are often younger, so I don't think it's just too many bugs. I also have a problem with pigeons. I've seen them perch on my plants and peck out the bugs. 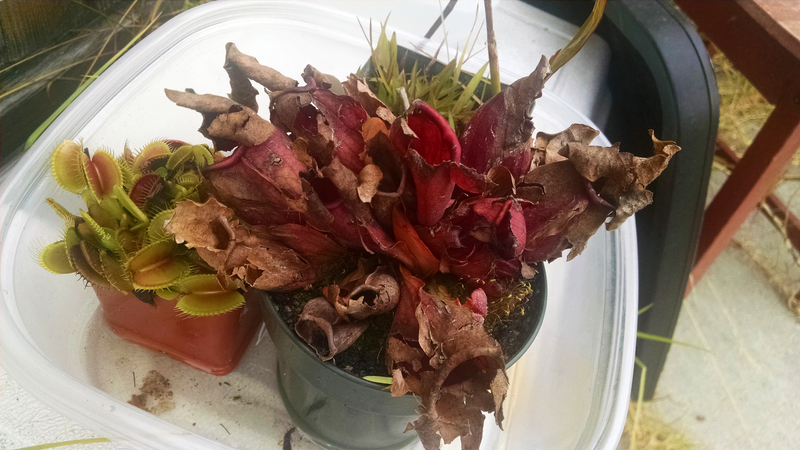 Pretty sure that's what happened to Sarracenia 'Abandoned Hope'. I still haven't Abandoned Hope yet! And my Sarracenia purpurea has been totally shredded. 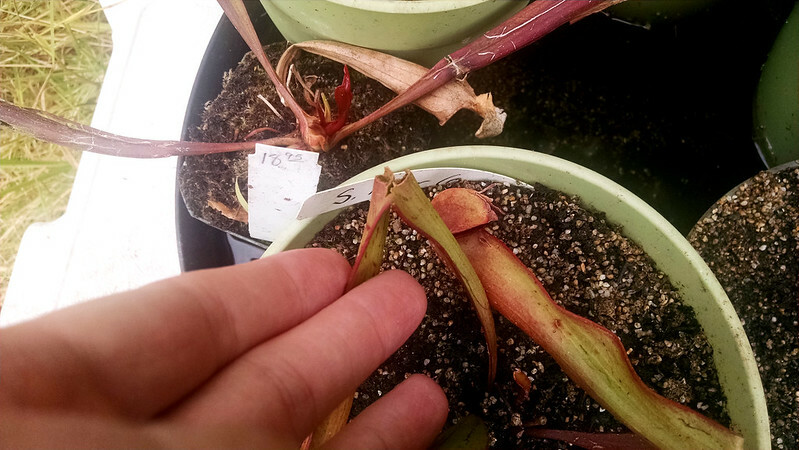 Someday my S. purpurea will be back in shape. However, there's new growth on both of these, so it's not like they can't bounce back. 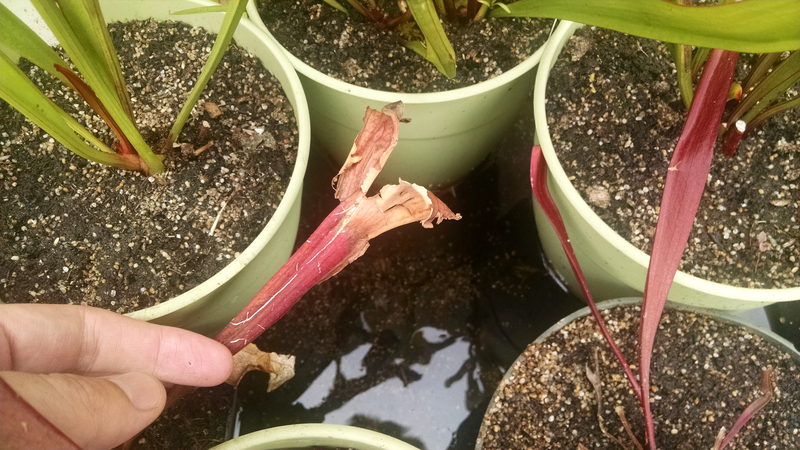 I guess I'll just have to be okay with somewhat ratty looking Sarracenia until I put together a nicer growing area. Oh well! Growing carnivores is always a learning process. One big plus I've noticed lately is that the S. leucophylla "Hurricane Creek" that I won at the Spring BACPS meeting auction has finally started sending up a pitcher. I couldn't get a decent picture, but that's exciting! I had given up on it almost.